Toronto singer-songwriter Clara Engel and New Haven-based An Historic share the bill at Best Video Performance Space on Wednesday, Nov. 28. The show starts at 7:30 PM and the cover is a sliding scale $5-10 (pay what you can in that range). 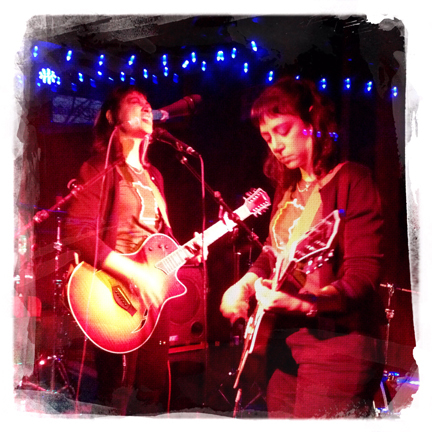 Based in Toronto, Canada, Clara Engel is a prolific and multi-faceted artist and musician. They have collaborated with musicians and artists from the UK, Germany, Brazil, Canada, Turkey, Iran, and the US. Engel’s music has been played on Italian National Radio, as well as BBC Radio 2, making it onto Tom Robinson’s show “BBC Introducing” on several occasions. Their music has been described as “folk noir,” “minimalist holy blues from another galaxy,” and “sung poetry.” Engel’s voice and guitar stylings place them singularly on the genre-map, somewhere between avant-garde torch singer and gothic-blues artist. Influences span genres and media, amongst them are Vasko Popa, Virginia Woolf, Theodore Roethke, Jim Jarmusch, Arvo Part, Meredith Monk, Robert Johnson, Gillian Welch, and Jacques Brel. 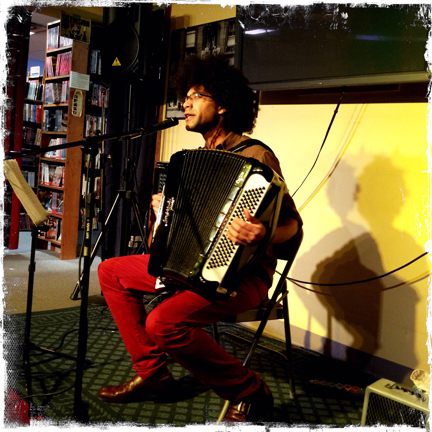 An Historic is the songwriting alias of composer/accordionist/vocalist Adam Matlock, focusing on frenzied and narrative songs with elements of Balkan music, cabaret, many varieties of art-song and American soul and punk. 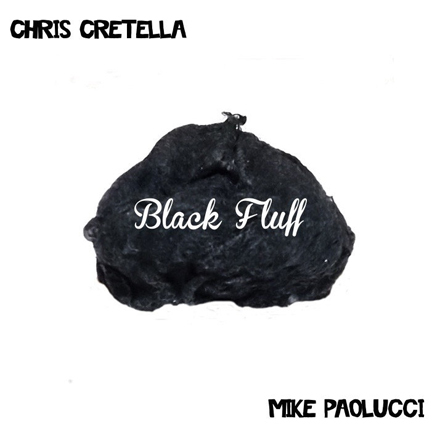 Songs are performed live with a core of solo accordion or piano and voice, and sometimes fleshed out and fully inhabited with the confident interplay of guitarist Chris Cretella, percussionist Michael Paolucci, multi-instrumentalist Brian Slattery and bassists Mike Tepper or Carl Testa. An Historic will be solo for this show. • Saturday, Nov. 24. JAZZ: JEFF FULLER & FRIENDS—CD RELEASE! 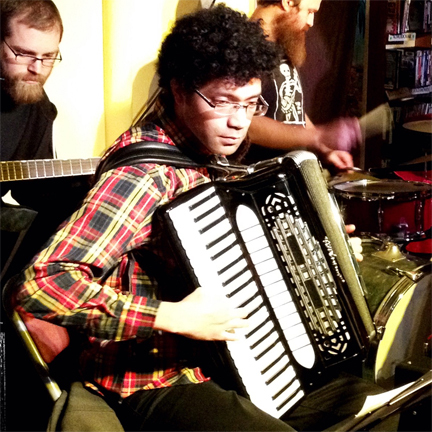 Olive Tiger and An Historic play solo sets at Best Video Performance Space on Thursday, Dec. 7. The show starts at 8 PM and the cover is $5. Olive Tiger is driven by the obsessive need to bring imagined sounds to life, creating experiences of beauty and transcendence in the process. 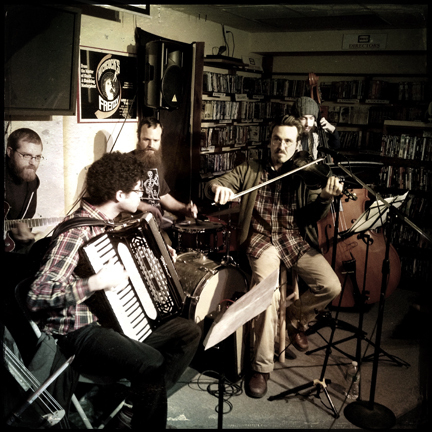 Based in New Haven, CT, Olive uses cello, guitar, and electronics to craft a unique blend of melody-driven orchestral sounds. Olive’s hauntingly beautiful vocals and cello are intensified by a loop pedal, crafting a result landing somewhere between My Brightest Diamond, tUnE-yArDs, St. Vincent, and Andrew Bird. Olive Tiger’s debut album “Until My Body Breaks” was released September 2016. With her group (also known as Olive Tiger), she played Center Church on the Green in New Haven this past June as part of the ALTAR-d Spaces programming of the International Festival of Arts & Ideas. 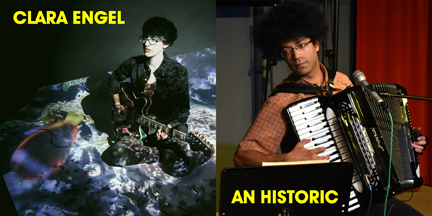 An Historic is the songwriting alias of composer/accordionist/vocalist Adam Matlock, focusing on frenzied and narrative songs with elements of Balkan music, cabaret, many varieties of art-song and American soul and punk. 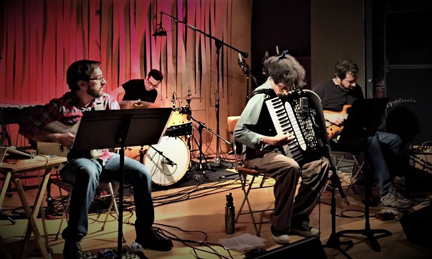 Songs are performed live with a core of solo accordion and voice, and sometimes fleshed out and fully inhabited with the confident interplay of guitarist Chris Cretella, percussionist Michael Paolucci, multi-instrumentalist Brian Slattery and bassists Mike Tepper or Carl Testa. 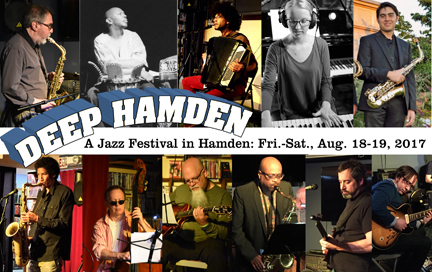 Best Video Performance Space hosts a 2-day jazz festival, Deep Hamden, on Friday, Aug. 18, and Saturday, Aug. 19. On Friday, Ag. 18, the festival features saxophonist Allen Lowe with a big band performing Deep Hamden: A Blue Suite (starting at 8 PM; with saxophonist Jovan Alexandre). Brian Jarawa Gray (Jarawa) and The Healing Drum Society headline Saturday night, Aug. 19, performing The Healing Drum, starting at 8 PM. 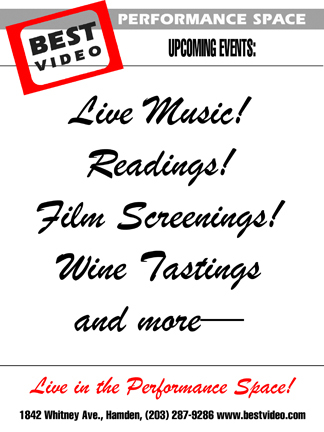 Pianist Rosemary Minkler and her Quartet featuring saxophonist Will Cleary perform at 6 PM. 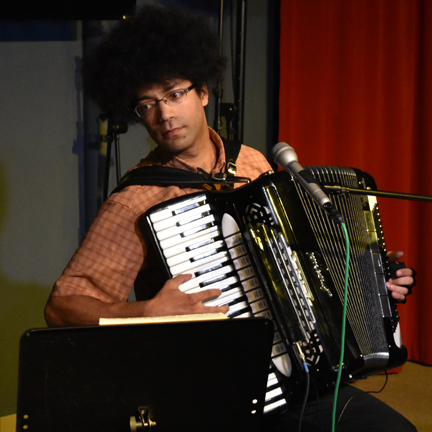 Solo accordionist (and member of Anthony Braxton’s Orchestra) Adam Matlock opens the Saturday program at 5 PM. Tickets are $10 each night, $15 for both nights, and advance tickets are available through Brown Paper Tickets. Allen Lowe is a saxophonist and American music historian. He lectures at Jazz at Lincoln Center, and is a Visiting Professor at the Berklee School of Music. He has recorded as a leader with Julius Hemphill, David Murray, Gary Bartz, Hamiet Bluiett, Ken Peplowski, Don Byron, Doc Cheatham, and Roswell Rudd. Brian Jarawa Gray and the New Village Drummers. Brian Jarawa Gray— Jarawa—has more then 30 years of experience as a Percussionist, Song writer, Band leader and Performing artist, He has taught world music in public, private schools and Universities in Connecticut and New York. Jarawa performs Natural Centric Drumming and the music of the African Diaspora. He is a featured artist on recordings by Oliver Lake, Pheroan Aklaff, Yosuke Yamashita, The Visions Band and His own CDs are titled Berdisha Pertasha, You’re Soo Special and Stories of Life. Jarawa has Performed at. Lincoln Center with Jay Hoggard SOBs With Pheroan Aklaff Seventh Avenue Theater With Joseph Jarmin Brooklyn Academy of Music with Chuck Davis Dance Co. and many more venues across the country. Adam Matlock is a composer and performer, working within the realms of art music, electronics, folk, international music and traditional songwriting. He utilizes the alias G. Zarapenecko for electronic compositions and experiments, An Historic for original songs, and his own name for longer-form compositions as well as the occasional solo performance. He works with the legendary composer Anthony Braxton. Born and raised in Waterbury, CT, Rosemary Minkler is an accomplished young pianist, composer, and audio engineer. She grew up surrounded by music and began studying piano at an early age, discovering her passion for jazz at the Litchfield Jazz Camp. She continued her studies on a full scholarship to Western Connecticut State University, where she received a degree in Audio and Music Production with a concentration in Jazz Piano. Here, she studied jazz piano with Peter Tomlinson, classical piano with Russell Hirshfield, classical composition with Kevin Isaacs, and applied audio with Douglas O’Grady and Edward Dzubak. In addition, she worked closely with jazz guitarist/composer Jamie Begian as well as renowned jazz saxophonist Jimmy Greene. 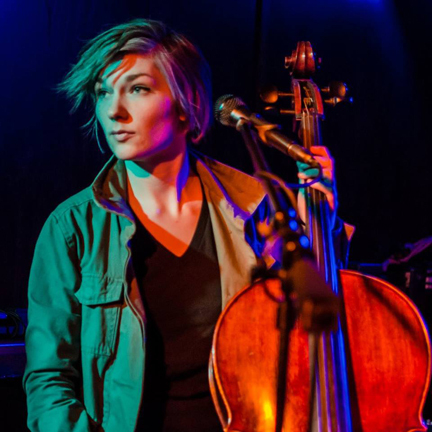 She is currently a member in Danbury-based fusion collective The Recess Bureau and often plays with other musicians in the Connecticut and New York area. Rosemary’s most recent release, Prospectus, is her debut as a bandleader, composer, and audio engineer. Will Cleary hails from Houston, Texas, where he began his jazz studies at the Summer Jazz Workshop and Houston’s High School for the Performing and Visual Arts. He then obtained his Bachelor of Music degree at the Oberlin Conservatory, studying with Gary Bartz, Robin Eubanks, and Dan Wall. He received his Master of Music degree in 2010 from the Eastman School of Music under the tutelage of Walt Weiskopf and Bill Dobbins, and was the recipient of the Raymond and Maxine Schirmer Prize in Jazz Performance. Will has played with Slide Hampton, Chuck Mangione, Conrad Herwig, Marvin Stamm, Marcus Belgrave, Charles McPherson, Kim Waters, Bob Sneider, Dave Glasser, and Pat LaBarbera. He has opened for Wynton Marsalis and the Jazz at Lincoln Center Orchestra, as well as for Jason Moran. Other significant performances include appearances at the Houston International Jazz Festival, the Detroit International Jazz Festival, the Rochester International Jazz Festival, and services at the Cathedral Church of Saint John the Divine in New York City. He is currently playing and recording with various artists in New Haven, Connecticut, and the surrounding areas. Jovan Alexandre — who will perform with Allen Lowe’s ensemble on Friday night — is a tenor saxophonist, who made his debut as a leader at the prestigious New York City Winter JazzFest [on January 9, 2015]. He has been a soloist on recordings for drummers Ralph Peterson (Outer Reaches ) and Winard Harper (Coexist, sharing the tenor spotlight with Frank Wess ), and for the South African jazz singer Nonhlanhla Kheswa (Meadowlands, Stolen Jazz ). His first album as a leader, Collective Consciousness, was released worldwide [on February 24, 2015][on Xippi Phonorecords, XP22540]. Alexandre’s Wallingford is fifteen miles due north of New Haven. Several times a week during his high school years, he made the further trek northward to Hartford, a city rich in jazz history, to study at the Artists Collective, a neighborhood institution founded to promote the art and culture of the African diaspora and much beloved of Hartford’s African-American and Caribbean communities. In the 1980’s, the University of Hartford’s Hartt School, a nationally prestigious conservatory, asked Jackie McLean to establish a jazz performance department. Alexandre is one of dozens of alumni of the Artists Collective to have continued their studies at Hartt. He graduated with distinction [in 2011] from the jazz program, now formally known as the Jackie McLean Institute of Jazz. Shortly after graduating from Hartt, Alexandre began to earn an almost “underground” reputation as one of the most compelling and talked- about of the new tenor saxophone soloists, through appearances with top-name musicians such as Hank Jones, Dionne Warwick, Curtis Fuller, Harold Mabern, Larry Willis, Charles Tolliver, Randy Brecker, Antoine Roney, Benito Gonzalez, Shimrit Shoshan, Ray McMorrin, Josh Evans, Curtis Torian, Tadataka Unno, and Kendrick Oliver & The New Life Jazz Orchestra. With the release of his debut album Collective Consciousness, and more regular appearances in New York City and national and international touring on the horizon. Indie rock group Zoo Front and solo performer An Historic play Best video Performance Space on Thursday, Aug. 11. The show starts at 8 PM and the cover is $5. The last couple of years have been busy ones for Zoo Front. Their CD Red Stereo Dress marked the beginning of a new era for the band, with Nancie Tief making her singing and songwriting debut. Adding to the fun, they adopted a new working philosophy they call ABM – “ambient background mischief”. The idea is to add a subliminal track to each song that somehow fills out the sound in a way that defies definition. 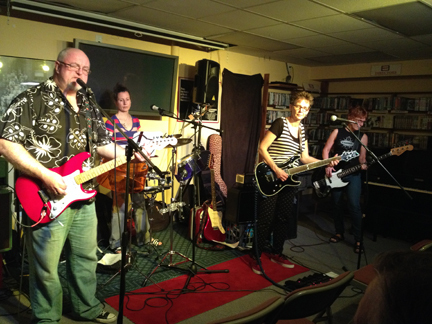 The personnel is Ed Ekendu (Guitar), Nancie Tief (Guitar), Julie Riccio (Drums) and Ju Dee Luna. A whole host of New Haven-area musicians and groups join together at Best Video Film & Cultural Center on Friday, Jan. 29, to pay tribute to the late legendary rock musician David Bowie. 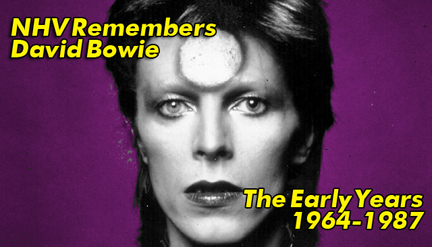 This show focuses on songs recorded by Bowie from 1964-87; a second show covering Bowie’s post-1987 oeuvre will be held Feb. 13 at Cafe Nine in New Haven. Cover for this show is $5 and it starts early—7:30 PM. Elisa Flynn and An Historic play sets at Best Video Performance Space this Thursday, Nov. 19. The music starts at 8 PM and the cover is $5. Brooklyn indie folk chanteuse Elisa Flynn is a multi-instrumentalist and songwriter who has played in indie rock, punk, and Americana bands for the better part of the last two decades. After leaving her last band and taking voice lessons from Shara Worden (My Brightest Diamond), she took her stronger voice and headed out with an acoustic guitar and a suitcase full of effects pedals to play solo. Her broodingly nuanced vocals and sardonic humor, laced with an undercurrent of unease, make a darkly gothic twist on the singer-songwriter genre. She has just released her new EP “My Henry Lee.” See elisaflynn.com for more info. Dr. Caterwaul’s Cadre of Clairvoyant Claptraps play the film music of Bernard Herrmann at Best Video Performance Space on Tuesday, July 21. The music starts at 8 PM and the cover is $5. Dr. Caterwaul’s Cadre of Clairvoyant Claptraps is comprised of Michael Tepper on upright bass, Adam Matlock on accordion and vocals; Michael Paolucci on percussion; Chris Cretella on electric guitar and Brian Slattery on violin, banjo, trombone and vocals (and original cellist Nathan Bontrager will join them for this show)–plays as much music as it’s able to: blues and murder ballads, Eastern European folk, traditional music from North and South America, tango, swing, classical music, and the songs of contemporary songwriters (including Matlock), using the influences of the music they love to create fluid, improvised arrangements.